I once spent a winter living in the little converted mill cottage you can see hiding in amongst the trees to the right of this photo. 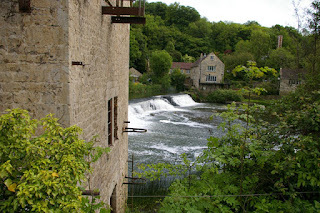 The noise from the weir was so loud that you would have to almost shout to be heard above it. It was constant and strangely tiring. I believe it sent me slightly mad. It was also the coldest house I have ever lived in. Normally used as a holiday let in the Summer, it had an electric meter which gobbled up 50 pence coins in a matter of minutes with the heaters on, so I hardly used them. I once went to bed leaving a glass of water on the side table. In the morning it was completely frozen - solid from top to bottom. This was the place where I once ate a pike. It was left on my doorstep by some local anglers and when I got home in the evening it was still alive. Despite my best efforts, it did not appear to die until two o'clock the following morning. I have since learned that you should put pike and eels in the freezer to kill them gently. One Summer day when I was re-visiting my old home, everyone in the pub garden (out of shot) was looking out over the weir saying that there was a diver in the water. As I looked, a black, sleek shape would surface briefly before diving again. I later found out what it was when I went down to the river bank. A massive Sea Lion suddenly stuck its head out of the water and floated there looking at me inquisitively. Its whiskery face seemed to smile at me like a dog, so I took it for a walk down river. It followed me all the way there and back, then disappeared when I left the bank. I later found out that it had escaped from Longleat and made the journey to Avoncliff via ditches and streams. It was miles from home. It was waiting for you to instruct it on what trick to do. I didn't have a red and white stripy ball with me at the time. Is that the weir at Claverton? I presume the Sea Lion was rescued and returned back to Longleat. It reminds me those chimps cleverly escaping from Belfast Zoo this week? Avoncliff. Yes, it was recaptured and sent home. It had been bullied by another male sea lion. I slept with everything on but my boots - alone. Your life has been magically strange. Strangely magical. I believe it's the gift of years and the recollection of them. Not the living of them, but the recollection. I hope I recollect correctly. I don't lie deliberately. Did it take you long to recover from the madness or are there recurring moments... just asking because loud bangs still make me jump ! Loud bangs always have made me jump. I have a friend who has a condition whereby loud bangs right behind him have no effect. That, to me, is stranger. That's a great blog heading. And has the authenticity of being an accurate description! Pike are so full of little bones that they are almost impossible to eat. And they taste mostly of muddy river water. In olden times, they really did use the bones as sewing needles. I’m not keen on freshwater fish to eat , trout included .... they have a strong earthy taste. Yes. All I needed was some fish and a red and white stripy ball. We could have formed an act. A frame with motor horns. Tom, I expect to see you on my blog roll. Please make it through. I am here - to serve.